Nikwax conditioning products are great for any active person who wants the best out of their outdoor equipment. 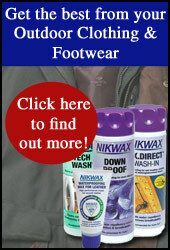 These products are recommended for hikers, walkers, mountaineers, horse riders, cyclists, hunters and mountain bikers. Nikwax conditioning has been recommended to be used regularly to prevent leather from drying out and cracking. These products will freshen up and soften baselayers, socks and sports gear. Look out for the blue cap!